Day 6 of a 13-day run through Germany, Switzerland, Italy and Austria. All of these photos were taken on May 28, 2011. Except for the photos of downtown Innsbruck and Cortina (Italy) plus several lakeside photos at Misurina, all of the other pics were taken through the bus windshield or a side window while in motion. On the night of May 27 we slept in the southern Austrian lowlands village of Villach where it rained most of the night. I feared the highly anticipated next day in the Dolomites would be ruined by rain. Little did I know the storm also brought significant snow to the mountains. The clouds broke at mid-morning to reveal a fresh white dusting on the high peaks which greatly enhanced an already dreamy landscape. My gratitude goes to Globus Tours and our Italian driver Sabino for spotless cleaning of the bus windows every night, making these shots possible. Most photos were taken with a Canon 18-200 zoom using shutter priority at 1/500 or 1/250 of a second, and care was taken to avoid fast moving foreground objects. Bus seats were assigned and rotated, so composing to eliminate window reflections from inside the bus was an ever present challenge. The day started gloomy with heavy overcast and lingering moisture from a steady overnight rain. 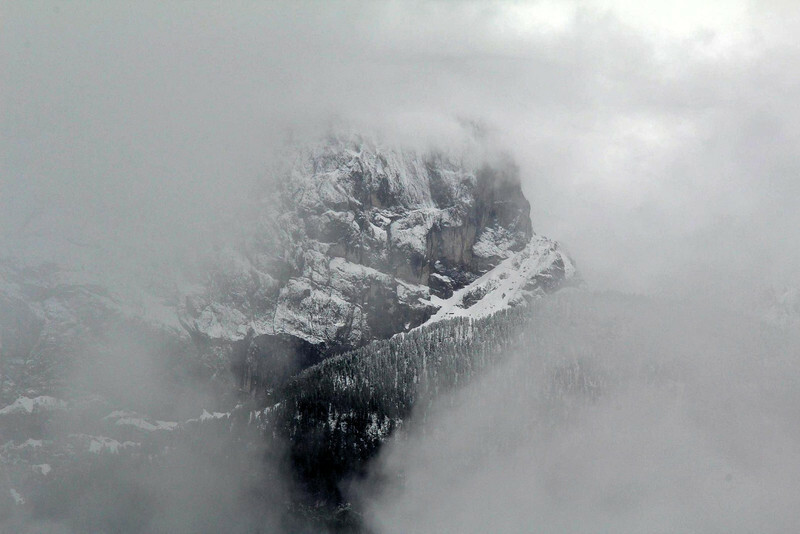 This was my first peek of the Dolomites, and the realization came that the night's rain storm had sprinkled the peaks with fresh snow. What a moment for me! If the clouds would continue to break up, it would be a great day of photography. They did, and it was.